WebServiceClient calls a web-service. It sends incoming data record to a web-service and passes the response to the output ports if they are connected. WebServiceClient supports document/literal styles only. WebServiceClient supports only SOAP (version 1.1 and 1.2) messaging protocol with document style binding and literal use (document/literal binding). Response does not need to be sent to output if output ports are not connected. WebServiceClient does not propagate metadata. WebServiceClient has no metadata template. A URL of the WSD server to which the component will connect. Connecting via a proxy server is available, too, e.g. : http:(proxy://proxyHost:proxyPort)//www.domain.com. The name of the operation to be performed. See Details. A structure of the request that is received from the input port or written directly to the graph. For more information about request generation, see Details. An optional attribute to Request Body structure. If not specified, automatic generation is disabled. For more information about request generation, see Details. A mapping of a successful response to output ports. The same mapping as in XMLExtract. For more information, see XMLExtract Mapping Definition. A mapping of a fault response to output ports. The same mapping as in XMLExtract. For more information, see XMLExtract Mapping Definition. A set of name-value assignments defining custom namespaces. The namespace binding attribute is used only for Response Mapping and Fault Mapping. When true, all elements with the same name are mapped, no matter their depth in the tree. See example in Details. Request HTTP Headers HTTP Header(s) and their values to be added to HTTP request headers. Response HTTP Headers HTTP header(s), that will be read from the HTTP response. You can map the headers in Response mapping to output metadata fields. Username [ 1] A username to be used when connecting to the server. Password [ 1] A password to be used when connecting to the server. An authentication domain. If not set, the NTLM authentication scheme will be disabled. Does not affect Digest and Basic authentication methods. An authentication realm to which the specified credentials apply. If left empty, the credentials will be used for any realm. Does not affect NTLM authentication scheme. Timeout for the request; by default in milliseconds, but other time units may be used. Specifies a URL that should be used for the requests instead of the one specified in WSDL definition. Specifies a field containing a URL that should be used for the requests instead of the one specified in WSDL definition. If true, the component ignores certificate validation problems for SSL connection. [ 1] See Authentication section for more details. After sending your request to the server, WebServiceClient waits up to 10 minutes for a response. If there is none, the component fails on error. If you switch log level to DEBUG, you can examine the full SOAP request and response in a log. This is useful for development and issue investigation purposes. Operation name opens a dialog, depicted in the figure below, in which you can select a WS operation by double clicking on one of them. Operations not supporting the document style of the input message are displayed with a red error icon. Figure 63.7. 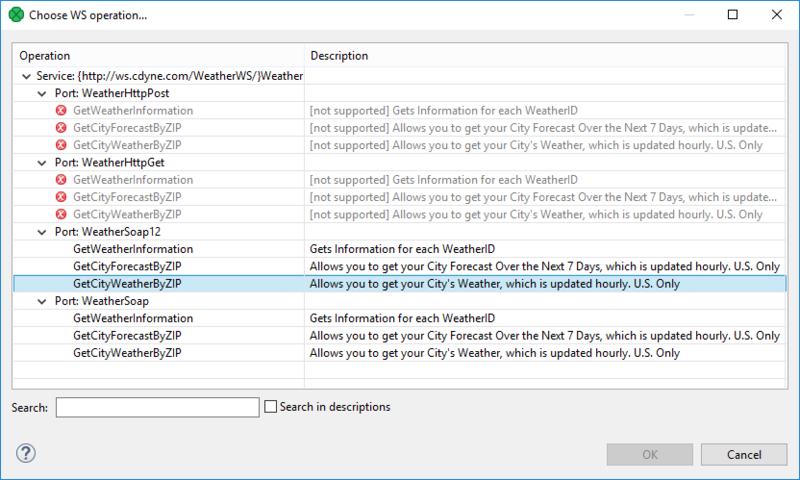 Choosing WS operation name in WebServiceClient. Request Body structure and Request Header structure - open a dialog showing the request structure. The Generate button generates the request sample based on a schema defined for the chosen operation. The Customized generation... option in the button's drop-down menu opens a dialog which helps to customize the generated request sample by allowing to select only suitable elements or to choose a subtype for an element. msg1 with Use nested nodes switched off. In order to extract msg2, you would need to create an explicit <Mapping> tag (one for every nested element). If authentication is required by the web service server, the Username, Password and, in the case of NTLM authentication, Auth Domain component properties need to be set. There are currently three authentication schemes supported: NTLM, Digest and Basic. NTLM is the most secure while Basic is the least secure of these methods. The server advertises which authentication methods it supports and WebServiceClient automatically selects the most secure one. Auth Realm can be used to restrict the specified credential only to a desired realm, in case Basic or Digest authentication schema is selected. Auth Domain is required by the NTLM authentication. If it is not set, only Digest and Basic authentication schemes will be enabled. Also note that it is not possible to specify the domain as part of the Username in form of domain\username as is sometimes customary. The domain name has to be specified separately in the Auth Domain component property. Special characters, e.g. < that appear in a request body should be typed as entities (&gt;). Otherwise < would be interpreted as a beginning of a new xml element. CloverDX Server provides a webservice API to get status or perform operations. Send echo request to CloverDX Server and get the response. The server listens on 127.0.0.1 on TCP port 38080. Use the WSDL URL, Operation name, Request Body structure and Response mapping attributes. Set WSDL URL to http://127.0.0.1:38080/clover/webservice?wsdl. In Operation name choose the echo operation. In Request Body structure, use Generate in the upper left corner and then fill in the string to be echoed. In Response mapping, map the out element to any output metadata field. The output port has to be attached, otherwise the output cannot be mapped.